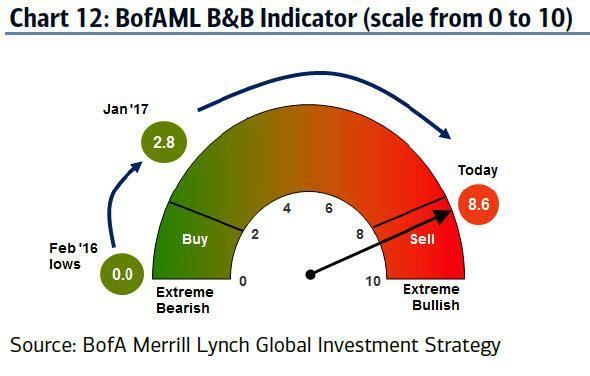 BofA: "Our Sell Signal Was Triggered On Jan 30, S&P 2686 Is Next"
Last Friday, when the S&P hit an all time high and inexplicably melted up in the last hour of trading in a burst of frenzied buying, we warned that according to Bank of America, "Biggest Sell Signal In 5 Years Was Just Triggered." Incidentally, on that very day, the S&P 500 bull market became the second largest of all time last Friday, as the global equity market cap of $86.6TN rose $57.9TN from 2009 lows and $29.9TN from 2016 lows, according to BofA. In retrospect, following what is shaping up as the worst week for stocks since 2016, Bank of America was right. Now, in a follow up, Bank of America's chief investment strategist Michael Hartnett confirms in his latest Flows Show that the bank's indicator of market sentiment officially hit a "sell" signal on January 30, pointing to a downturn for risk assets. Specifically, the bank's "Bull & Bear" indicator of market sentiment jumped from 7.9 to 8.6 on Jan 30, driven up by record inflows to equities and strong hedge fund risk appetite. ... while 10-year U.S. Treasury yields fell 58 basis points on average after the trigger. As a result of the trigger, the bank's strategists forecast a decline of the S&P 500 to 2,686 points by the end of the first quarter. As usual, however, the bankers hedged their bets, also making the case for the S&P 500 to shrug off the "sell" trigger and rise above 3,000. Sentiment signals could be less relevant, they noted, in a world in which equities have surged higher thanks to central banks' extraordinary post-crisis injections of liquidity into global markets. And, as already seen this week, the Bank of Japan intervened on two occasions to make sure 10Y JGB yields did not jump above the central bank's 0.1% target on the 10Y. "A speculative equity overshoot has begun, driven by a central bank liquidity supernova and rotation out of $10.8 trillion of negative yielding global debt, suggesting we have entered a 2 standard deviation world ... making sentiment signals less relevant" BofA wrote. This was confirmed by some of the bank's clients in Asia, who were sanguine about a potential pullback. 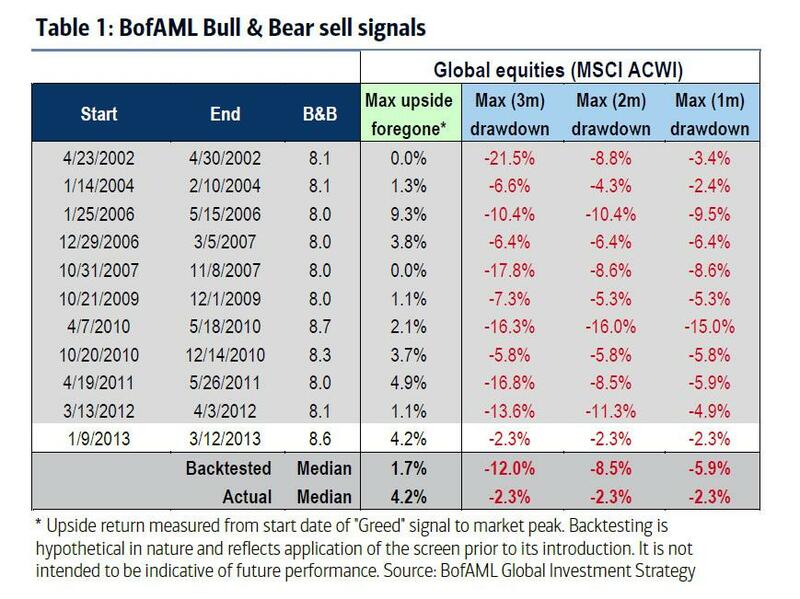 "Too early for a tradable correction... pullback 2-3 percent max which will be bought... macro & investment backdrop too perfect to sell," BAML quoted clients as saying. "Equity price momentum is positive and trend followers are not likely to reduce equity exposure. While the recent move was concerning for its correlation properties (bonds, equities and commodities all going lower), overall the volatility of multi-asset portfolio is still very low, and the increase was relatively small (e.g., increased from —4% to —5%)." On the other hand, a deeper correction than predicted could be triggered by a jump in wages causing a spike in the MOVE index of bond volatility, driving the S&P 500 to under 2,600 points. But with the market already worrying about a bond shock, a bigger surprise would be a February of weaker macroeconomic indicators, a stronger dollar and lower yields, the note said. "We think 'bond shock' too consensus and EPS shock, credit shock, dollar shock more likely catalysts for cross-asset volatility spike," they wrote. SPX <2600: catalysts for deeper correction...surge in wages (eg Jan AHE >0.4%) causes spike in Treasury vol (MOVE index); but since all worried “bond shock” bigger surprise would be Feb of weaker macro, stronger dollar, lower yields (nb weakness in US homebuilders XHB early sign rates starting to bite). The "sell" signal hit after a roaring New Year's rally across global equities, with benchmarks in the U.S. and Europe driven to new records. A "remarkable" $102 billion poured into equity funds since the start of the year, already more than a third of last year's total of $280 billion. Putting the frenzied inflows in perspective, BofA notes that a "mssive" $25.7 billion was plowed into equities, with $5.7 billion going into bonds. Flows figures for the year so far also showed initial stirrings of a shift away from ETFs in favour of active funds after a bumper year for passive in 2017. 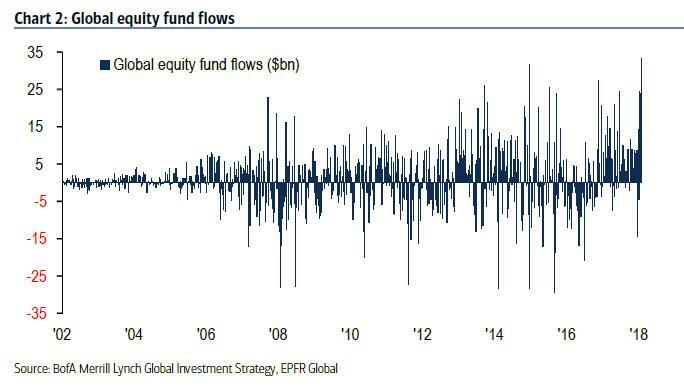 Last year's flows were comprised of $441 billion into ETFs and $161 billion outflows from long-only funds, while this year $81.7 billion went into ETFs and $21 billion flowed into long-only funds. Further, as we also noted last week, the bank's emerging markets 'sell' signal was also triggered as inflows to EM equities in January surged to above 1.8 percent of total assets under management. The note also points out that YTD flows have shown a "stubborn" bid for asset classes likely to benefit from deflationary forces, with a record $5.7 billion going into tech stocks and $35.4 billion into investment grade and EM credit. But investors also drove money into inflation plays and weak dollar plays, with $12.5 billion going into Japanese equities, $3.6 billion into financials, a record $4.4 billion into inflation-protected U.S. bonds (TIPS) and $24.4 billion into EM equities. In other words, a peak "barbell" strategy, with investors expecting market mood to shift from one extreme to another, most likely with the help of central banks.